Don't worry, this is better than part one! The original Madagascar, while entertaining, seemed a little awkward throughout, with jerky pacing, a meandering plot and a few gags that weren’t funny. Not to mention the out-of-place adult humor. Thankfully, Madagascar: Escape 2 Africa rectifies most of these issues, but overshoots the mark in some areas by writing a little too much for adults. 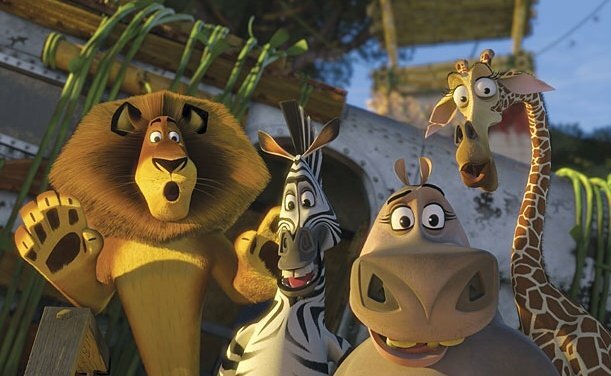 When last we left Alex (Ben Stiller), Marty (Chris Rock), Melman (David Schwimmer) and Gloria (Jada Pinkett Smith), they were shipwrecked on Madagascar. With the help of the industrious penguins, the unlikely quartet and some of their new friends take a nightmarish plane ride and crash-land in Africa where they meet their counterparts – lions, zebras, giraffes and hippos – for the first time. Alex is reunited with his parents, Marty realizes he’s not alone in the world, Gloria starts dating and Melman puts his medical knowledge to good use. Unfortunately, while Africa may seem like a paradise, it does come with its fair share of downsides. Fans of the 2005 Madagascar will transition seamlessly to part two. All of their favorite characters return for more high jinks, the animation looks as good as ever and the voice talent – especially Sacha Baron Cohen as King Julien – have retained the sparks that distinguished their characters. If you haven’t seen part one, that’s OK, since you’ll get an artfully done recap to bring you up to speed. Thankfully, the writing in M:E2A is much stronger than in part one, giving each of the four main characters their own distinct storyline. Alex’s plot definitely takes center stage, however, as he tries to gain acceptance from his father, voiced by the late Bernie Mac, and re-enter the pride. Young children will definitely hang on to this story and enjoy its fun resolution. And while the conventional story will resonate with adults and preteens, young children may grow restless. Will they understand why Alex starts snapping his fingers by his knees and the soundtrack switches to West Side Story when he misinterprets a fight to be a dance-fight? Probably not. The IMAX theater I watched this movie in was packed with small children that were largely silent during scenes like this, even with the crystal clear, gigantic visuals. The kids will, however, get a kick out of the indestructible old lady from part one who makes an appearance here. In one respect, the innocence of children comes in handy regarding Marty’s story. Early on, he tries to impress the other zebras with his athletic abilities only to find out they have the same athletic prowess. “If you can do it, we can too,” they say in unison, using Chris Rock’s voice. Later, when Alex can’t tell Marty apart from the other zebras, it’s obvious that they all look the same. I half expected Chris Rock to break out into one of his expletive-filled standup routines about racial stereotypes. Thankfully, this will all fly over most children’s heads, but many adults may be left scratching theirs, wondering why it’s even in the movie. At the very least, the film was wise enough to use zebras to tell this part of the story instead of some other animal.